When the New Year comes around many of us are trying to be more conscious about what we’re eating, but that doesn’t mean mealtime has to be boring. This delicious salad with maple vinaigrette dressing is a great accompaniment to any healthy eating plan and can be enjoyed as a light lunch or healthy side dish. The maple vinaigrette can be used to spruce up any salad, so feel free to play around with whatever salad vegetables, nuts and seeds you might already have hanging around! 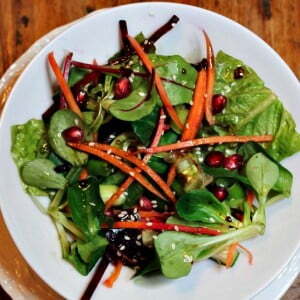 Bursting full of colour, flavour and goodness, you need to give this salad a try. This maple vinaigrette can be stored in an airtight container for up to 2 weeks in the fridge. Enjoy, and be sure to tweet your maple syrup creations to @realmaplesyrup so we can see what you’ve been making.